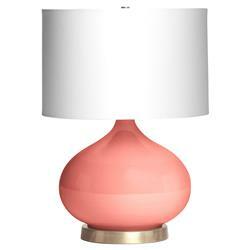 Like a breath of fresh air, this coral pink glass table lamp uplifts instantly. The glass base, blown into a classic teardrop silhouette, adds a feminine dash of color which works wonders alone or in a pair. Midcentury fans and traditional style enthusiasts will find plenty of reasons why this piece is a need and not a want!